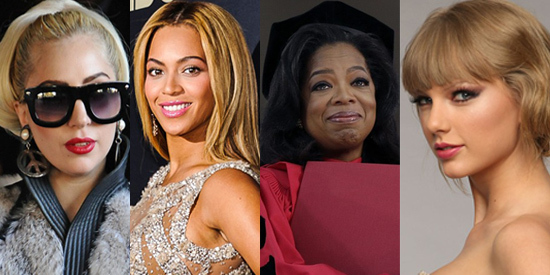 Six female celebrities dominate the top ten in Forbes 100 Most Powerful Celebrities of 2013. Oprah Winfrey leads international female artists (L-R) Lady Gaga, Beyonce, and Taylor Swift who place second, fourth, and sixth, respectively. In its annual list of 100 Most Powerful Celebrities, American business magazine Forbes names Oprah Winfrey its “most powerful” for 2013. The world-famous Oprah regains the top spot after placing second for the last two years and clinching the number one title four times before. Forbes stresses in its report, “Never count Oprah out” as it likewise notes that the influential TV personality/media mogul/philanthropist topped the list sans the regular run of her eponymous daytime talk show. The Oprah Winfrey Show, of course, ended in May 2011. Despite earning an estimated $77 million from June 2012 to June 2013, a setback considering her $165 million income in the previous year, Oprah endures as a powerful figure in Hollywood counting her money and fame merits in press mentions and social networking. In the female-dominated Top 10 with Oprah are female artists Lady Gaga, Beyonce, Madonna, Taylor Swift, and talkshow host Ellen DeGeneres, who place second, fourth, fifth, sixth, and tenth, respectively. Meanwhile, four men made it to the top 10—filmmaker Steven Spielberg, who holds the third place; also rock band Bon Jovi, tennis star player Roger Federer, and teen pop star Justin Bieber, who landed the seventh, eighth, and ninth spot. In explaining its criteria, Forbes stated that it did not only base their list on the earnings or net worth, but “that most ephemeral of riches”—fame. The magazine tallied each time a celebrity was mentioned in print and on TV. A celebrity’s presence on the Net likewise mattered, all the more how he/she is viewed by American consumers. In the Top 50 are celebrities Jennifer Lopez (12), who was last year’s number one; Rihanna (13); sports stars Tiger Woods (15), Le Bron James (16), David Beckham (19); also Hollywood actors Robert Downey Jr. (20), Angelina Jolie (41), and Jennifer Lawrence (49). Fifty Shades of Grey author E.L. James makes it to number 42. Also included in the Forbes 100 Most Powerful Celebrities is Filipino boxing champion, Manny Pacquiao, who holds the 78th spot.